Common household wastes can be developed into nice gift items, fashion accessories and even objects of desire this theme was the major crowd puller during 15th Raahgiri on Janpath today. A huge elephant made of waste paper was also placed near the main stage drawing attention. Artifacts created from newspaper waste, plastic bottles, boxes and other common waste materials were transformed into presentable alternatives by artists. While old newspapers were given the shape of attractive fancy items by Art Ya Craft in association with Apparel Training and Design Centre (ATDC), Mancheswar, another city-based organisation Women in Society Help (WISH) attracted people for its innovative ideas on reuse of the plastic waste. Patra displayed various objects created by the students, associates of Art Ya Craft and ATDC. In fact, ATDC students and faculties helped Art Ya Craft in getting more creative inputs to action and to make apparel and fashion accessories from old newspaper. The items included paper tiara, hand bags, flowers, vase and purse. Book Reading Marathon (Bookathon), which was organised for the first time, by city-based Bakul Foundation in association with Rotary Club of Bhubaneswar (Heritage) attracted many people and especially students. A large group of students from KIIT International School also came with their teachers to read books from a collection of 1,000 titles at the Bakul point on Janpath. In fact, the entire world celebrated April 23rd as World Book Day. Activists of Bakul also distributed tree saplings to people, but it seemed, people were so interested to plant the saplings and make a green impact in the world that there was a `green rush’ at the venue. The tree saplings were distributed as a symbol to remember World Earth Day on April 22. City-based Kriya Yoga Foundation Trust of VSS Nagar organised two traditional dance forms i.e. Ranapa and Pailka. While Ranapa is prevalent among the cowherd communities of South Odisha, mainly in Ganjam district, Paika is a martial dance form from Khurda. Odissi was also staged. The trust also organised awareness on how to conserve the house sparrow birds and plant more trees to fight global warming. Volunteers of the trust also conducted a cleanliness drive. Maya Academy of Advanced Cinematics organised clay modelling activities, which attracted a huge crowd comprising youngsters. Today models of two characters from the famous Hollywood movies Terminator and Star Wars respectively were displayed before the public. 15th Raahgiri event was inaugurated by a group of dignitaries comprising Editor of The New Indian Express (Odisha) Srimoy Kar, local MP Prasanna Patsani, MLA (North) Priyadarshi Mishra, Mayor Ananta Narayan Jena and Deputy Mayor K Santi among others. Singers from Amakalakar Parivar and Rahul Dhal Praharaj performed many interesting numbers to entertain the crowd. 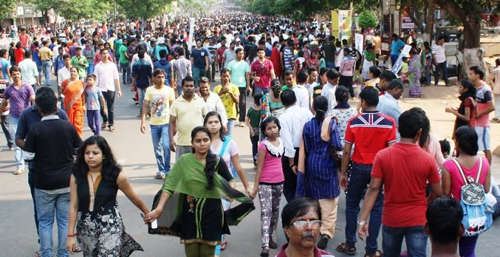 Bhubaneswar observed its 13th ‪‎Raahgiri today amidst much enthusiasm and fervour. It was indeed amazing to see so many of you joining in to reclaim the streets despite of such a sultry weather. Along with core activities like walking, cycling, skating and yoga; Live music dance and storytelling garnered much engagement and interaction. City-based Art Ya Craft attracted a huge crowd with its colourful designs with discarded plastic and pet bottles to make Christmas tree, pen stand, small cups and other items. The Maya Academy of Advanced Cinematics organised a clay modelling workshop in which Kolkata-based Sumanta Guha guided students and youth of the city the nuances of the clay modelling activity. Art Ya Craft volunteers also conducted face tattoo sessions to spread several social messages for the public. The People’s Cultural Centre (Pecuc) organised a children’s play and street plays on the occasion. While martial art was demonstrated by students of the KISS and the Unit II Girls’ High School, pets were also seen more in numbers at the Raahgiri venue. Raahgiri Bhubaneswar today truly went international with eight European performers from MasterPeace danced to the musical numbers spreading message on global peace and harmony. They also made their number more memorable by unfurling the Tricolour and the cheering crowd also rewarded them with much applause. While eight performers were from Slovenia, Slovakia and France, they are joined by eight local performers to stage the songs, which lasted over 10 minutes. MasterPeace is an award-winning grassroots peace movement that officially began in 2011, with offices in Cairo, Utrecht and Mexico City. The organisation’s vision is to inspire everyone to use their talent and energy for building peace and togetherness. MasterPeace Clubs are currently active in 40 countries, primarily in conflict areas, involving thousands of young peace builders. Masterpeace India was founded in Bhubaneswar in 2013 with the involvement of more than 500 youth volunteers. 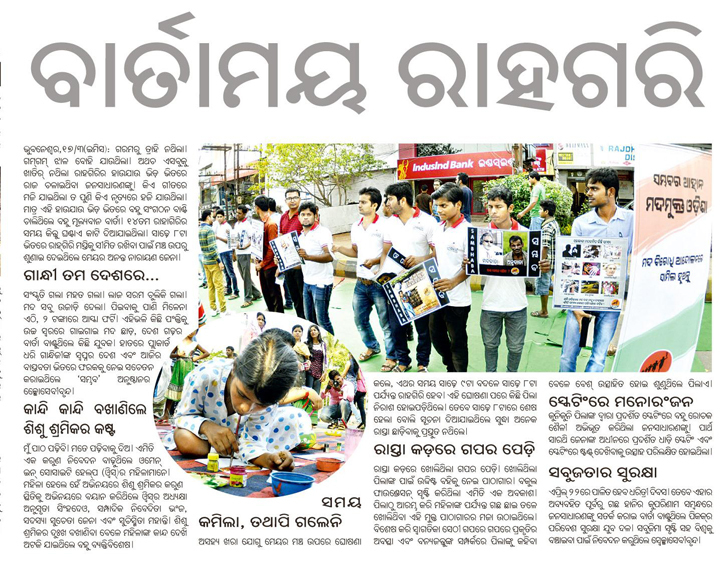 Bakul Foundation in partnership with Rotary Club of Bhubaneswar Heritage organized an ART-ATHON in Raahgiri today. This Art Marathon included 200 artists, young and old, comprising professional artists, art college students and school students as well. These artists paid a tribute to Raahgiri by going around and documenting the sights of Raahgiri, the different activities going on as well as the people at Raahgiri and their expressions. Satyabhama Majhi conceptualized the idea. Some of the artists also used the opportunity to give a message on world peace in the wake of the recent terror attacks in Brussels and other places in the world. These paintings will be exhibited at the Bakul Library in Satyanagar till1st April. 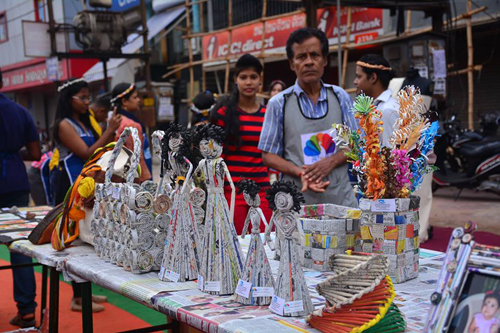 Art Ya Craft activity zone also attracted huge crowd with its art and craft work by children. The little ones prepared a model of London Bridge and paper models of various objects. They also took out an art activity to pain a huge canvas to draw inspiring actors from Bollywood. Kitchen Garden Foundation displayed interesting ideas to have rooftop kitchen gardens so that people can have their own vegetables and greens on their rooftops or the terraces. Singers from Ama Kalakara Paribara mesmerized the audience with their performance while singers like Rahul Dhal Praharaj also performed to a huge response from the crowd. During most of the songs the crowd was seen dancing and responding to the gestures of the performers making the renditions lively and meaningful. Members of Ama Kalakara Paribara are associated with Raahgiri since its first episode on January 17. Jai Odisha volunteers, as usual, organized the cycle-sharing activities efficiently and also distributed drinking water to the Raahgiri visitors through a dispenser near their activity zone. BMC Mayor Ananta Narayan Jena requested the visitors at Raahgiri to stop use of coloured polythene as it is toxic and has bad impact on our environment. ``The solution is with you. Citizens need to act like environmental activists and if required then file police complaints to stop the bad practice. We were designated as the No. 1 Smart City and we must come with this promise to become No. 1 clean city in the country,’’ he said. At the inaugural event among others, MP Prasanna Patsani, Rajya Sabha member Ranjib Biswal, Tourism and Culture Minister Ashok Chandra Panda, Bhubaneswar MLA (North) Priyadarshi Mishra, BMC Commissioner and BDA Vice-Chairman Krishan Kumar, CEO of the special purpose vehicle for the Smart City R. Vineel Krishna and Khurda Collector Niranjan Sahoo were present. BMC had displayed a hoarding of Tax defaulters in today's Raahgiri. The hoarding showing list of the defaulters was displayed just in front of the stage for public information. it may be noted that similar hoardings are displayed in all 3 zones of BMC. Dr. Prasanna Pattsani, MP, Bhubaneswar today said that Raahgiri spot has become a social meeting place. Often it is seen that old friends whom we are even unable to meet since long days, are spotted in Raahgiri area. It has become a social get together spot Dr. Pattasani added. Water dominated the theme at Raahgiri X today along the Janpath with eminent flutist Pandit Hariprasad Chaurasia joining the event as a guest. 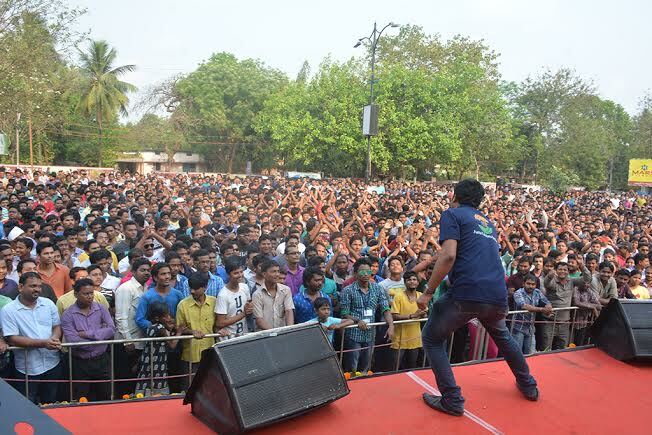 However, visitors were served the music by well-known singer of SaReGaMaPa fame Abhijit Ghosal. Ghosal started his rendition from the well-known Odia classic of yesteryear ``Hrudayara Ehi Sunyataku…’’ and the crowd cheered to every note of the music. Interestingly, while the day-time temperature is soaring high, the spirit of people at Raahgiri was such that people waited in the sun to listen to their singers till the last minute. Well-known philanthropist and founder of KIIT and KISS Achtyta Samanta also joined other dignitaries during the inauguration of the event. To make people aware about the seriousness of water scarcity, members of the social service organization Bakul took out a symbolic funeral procession with a huge water droplet made with 3-D craft and carried it on their shoulders across the entire 1.5 km stretch at the Raahgiri venue. 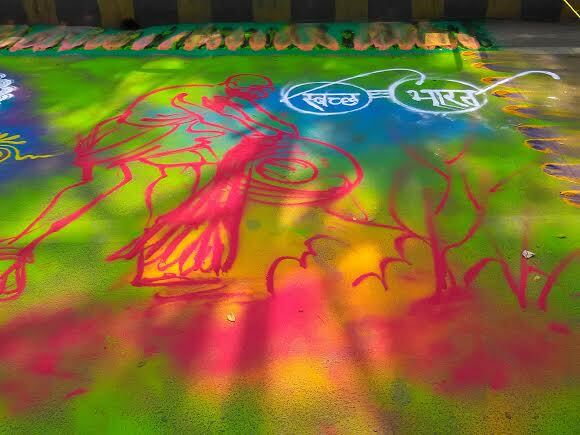 City-based social service organisation Nirmala Kruti Bikas Trust (NKBT), which came to the limelight during the Raahgiri IX last Sunday, today created again beautiful Rangoli art with a theme `Jal he to kaal he' and also flower art on the Janpath. 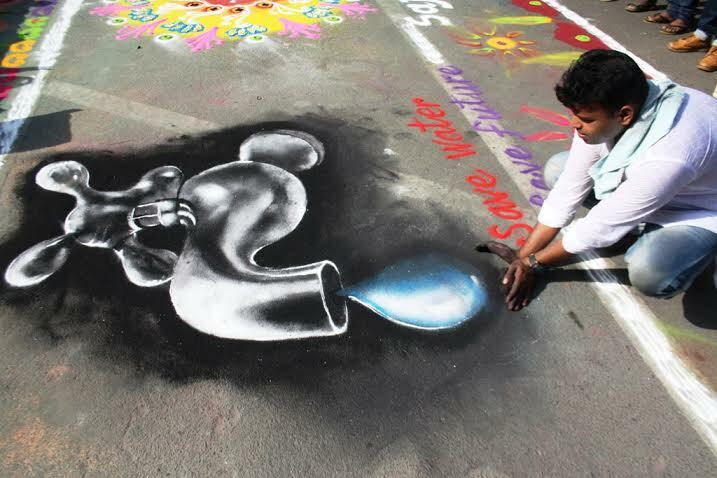 The Rangoli art was created by Bhawanipatna-based artist Manas Ranjan Panda. Kidzee School, Chandrasekharpur made an innovative quiz by putting photographs of the important water bodies in the city and asking visitors to select their names. It can be mentioned here that the world is going to celebrate World Water Day on March 22. Water bodies are very important in a city environment as they keep the increasing concrete jungles cooler. Chief General Manager of the State Bank of India (SBI) B Venu Gopala Reddy donated a cheque to BMC Commissioner Dr. Krishan Kumar and Mayor Ananta Narayan Jena for 100 cycles so that the civic body will promote non-motorised transport (NMT) in the city. Raahgiri is, in fact, celebrated along the Janpath to promote walking, cycling and skating activities to make the people happy and active. Department of Social Security and Empowerment of Persons with Disabilities created awareness on disability by celebrating the World Down Syndrome Day at Raahgiri, which is celebrated every year on March 21. Children with disabilities also staged nice activities where people in large numbers were present and they enjoyed it. Bhubaneswar MP Prasanna Patsani planted several saplings on the median of Janpath near the stage to launch a unique programme Mayor’s Green, in which city-based plantation activist group Green World Trust will add 500 saplings along the avenue in the city. While the ninth edition of Raahgiri became colourful with the strokes and sprinkles of ‘rangoli art’ by a city-based organisation, 20 women poets from Apurva recited women-centric poems to spread message on gender issues and infanticide with a theme ‘Kavitagiri’ along the Janpath today. Sarika Panda Bhatt, manager (cities and transport programme) of World Resources Institute (WRI) of India, one of the the brains behind Raahgiri, said ''the success of Raahgiri here has become a phenomenon in itself. With participation of more than 60,000 people on everySunday, the event here has become the largest Raahgiri in India. We are really proud about it from WRI. ‘Kavitagiri’ with a central theme was inspired by the celebrations on International Women’s Day, 2016. ‘’We wanted to take more messages on women-related issues to the general public through the magnificent platform called Raahgiri. We received overwhelming response,’’ said vice-president of Apurva, Ipsita Pujari. On the other hand, reduction of stage from two to one helped in controlling crowding. Ssafety cones on the cycling lane of the Janpath also provided relief both to walkers and cyclists. While this time 100 such safety cones were in place, the number will double from next Raahgiri. To retain the original character of Raahgiri i.e. to promote non-motorised transport like walking, cycling, skating and other physical activities authorities have decided to restrict music and dance except the Zumba towards the end of the activity zone. ‘Rangoli’ art by city-based social service organisation Nirmala Kruti Bikas Trust (NKBT) was done by Balangir-based artist Khira Sindhu Bhoi and Bhawanipatna-based artist Manas Ranjan Panda. They took up nice theme like Smart City, Swachh Bharat Abhijaan, Missile Man APJ Abdul Kalam and traditional ‘Rangoli’ motifs on the road and pulled thousands of crowd. Both have an experience of creating public art for over a decade and have already organised several shows in various parts across India during the recent past. They have participated not only at major art festivals, but with art workshops and art camps attended by noted artists. In an interesting development Jai Odisha a voluntary organisation run by people from various professional fields, organised a drinking water kiosk named ‘Jeevan dhara’ and supplied more than 200 litres of mineral water to thirsty public. Already the organisation is associated with BMC to distribute cycles among the public during Raahgiri. Among other activities cartoon learning lesson by a city-based weekly magazine also attracted attention besides the usual activities seen every week. A kiosk on rain water harvesting structures and its benefits also attracted huge crowd with dramatic presentation of the topic. More than 60,000 people turned up at the venue despite the humid conditions around the venue.